Kawasaki Ninja H2R has recorded a 400 km per hour of top speed recently in a stunt. The Turkish professional motorcycle racer Kenan Sofuoglu took the motorcycle on its first ever such run. Last year, the Japanese sportsbike maker built motorcycle achieving a top speed of 348.2 kmph on a deserted runway. After that Kenan Sofuoglu took the motorcycle to a 391 kmph run of late. Earlier Kawasaki claimed that this marvelous motorcycle has a top speed of 380 kmph. Surprisingly, Kenan Sofuoglu’s new record has broken that claim as well. The challenge was to achieve the 400 kmph mark in less than 30 seconds. Earlier the 348.2 kmph top speed record was set in a 1.6 kilometers stretch run. Sofuoglu reached the speed mark in 26 seconds during the stunt. 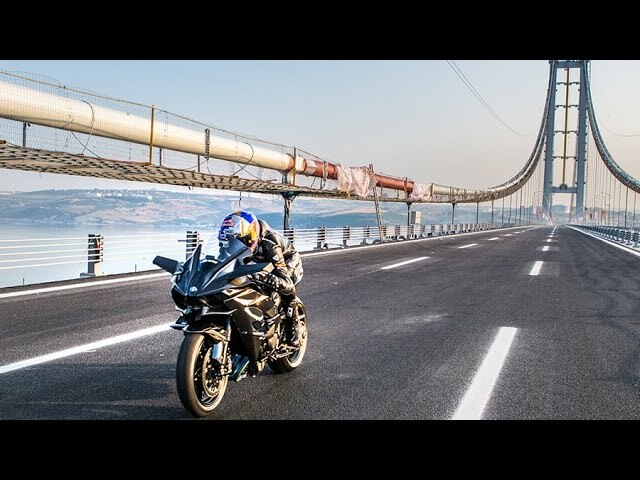 The stunt took place in a morning at a new bridge built across the Gulf of Izmit. The place is situated 50 kilometers away from Istanbul in Turkey. To achieve this success, Kenan had to go through hard training for last four months. He performed the stunt wearing a specially built leather suit. The Kawasaki Ninja H2R is truly an engineering marvel on two wheels. The motorcycle is powered by a 998 cc four-cylinder supercharged engine which kicks out 310 hp of peak power at 14,000 rpm, which double the figure of any street-legal motorcycles around the world. The sharply designed motorcycle has plenty of carbon fibre fairings. The chassis has been built to stay stable at extreme high speeds. It also comes with greater cornering ability and aerodynamic efficiency. To enhance the aerodynamic efficiency of Ninja H2R, Kawasaki took help from its aerospace wing. Kenan Sofuoglu has won four Supersport World Championships in 2007, 2010, 2012 and 2015. He joined the Indian Mahi Team which was owned by Indian Cricketer Mahendra Singh Dhoni. After performing the stunt he said that achieving 400 kmph with Kawasaki Ninja H2R was a dream came true.